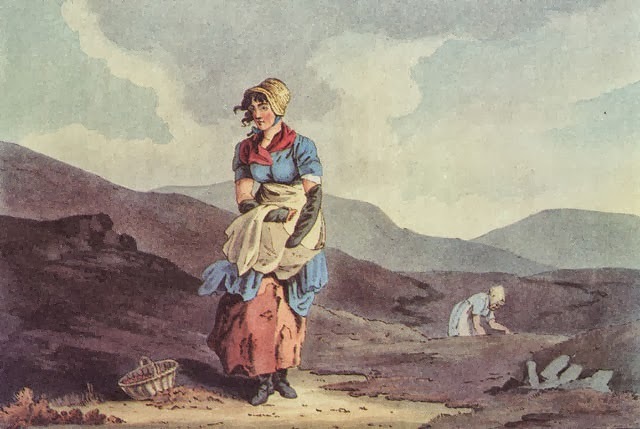 The following excerpts are 1) the accompanying text for the 1814 image; 2) the fens where wild cranberries once grew abundantly on the peat moss soil (2,000 - 4,000 pecks were gathered at 5 shillings per peck), but after the drainage of the fens, far fewer survived and sold for 30-50 shillings per peck in 1829; 3) 1822 recipe for Cranberry Tart, and 4) a Russian image, 1787. "The oxycoccus, or cranberry, is well known as a species of vaccinium, and grows plentifully upon the moors in the north of England. For many years it has been held in such estimation for pastry, that it is regularly brought to market like other fruit. Cranberries of larger size and more beautiful appearance are emported from Russia and America, but their flavour is much inferior to those grown in England. The girl [there is another woman on the right, bent over picking] here represented is gathering this berry upon the moors." 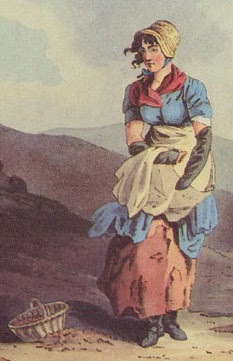 George Walker, The Costume of Yorkshire. 1814. "A principal part of that portion of the Fens which appertained to this parish (Friskney) was denominated the Mossberry or Cranberry Fen, from the quantity of Cranberries which grew upon it, in its wild and uncultivated state; the soil, a deep peat moss, being admirably calculated for their growth. It was not however until the commencement of the last century, that their value as a luxurious article of food was at all known in this parish, when they were brought into use by a native of Westmorland, in which county, and Cumberland, great numbers are annually gathered. After that period, and until the drainage of the Fens, the quantity gathered yearly in this place was very great. In some years, when the season was favourable, as many as four thousand pecks have been collected, but the average quantity was about two thousand. The general price paid to these who picked them, was five shillings per peck those who purchased them, disposed of them principally in Cambridgeshire, Lancashire, and Yorkshire, for the making the well-known Cranberry-tarts. Since the drainage and inclosure, few have been gathered, and those few have sold from thirty to fifty shillings per peck." Take Swedish, American, or Russian Cranberries, pick and wash them in several waters, put them into a dish, with the juice of half a Lemon, a quarter of a pound of Moist or pounded Loaf Sugar, to a quart of Cranberries. Cover it with Puff (No. l,) or Tart Paste (No. 4), and bake it three quarters of an hour; if Tart Paste is used, draw it from the oven five minutes before it is done, and ice it as (No. 31), return it to the oven, and send it to table cold. 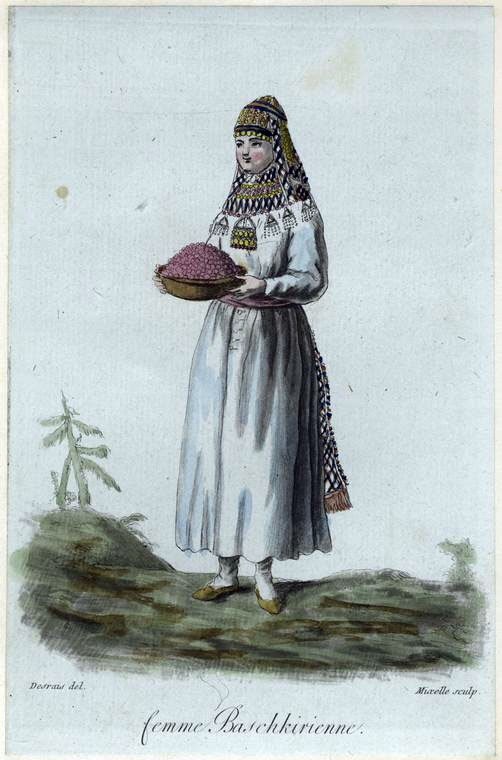 Femme baschkirienne (Woman from Bashkir region of Russia) is in Costumes civils actuels de tous les peuples connus… Paris: Pavard, 1787-1788. New York Public Library collection.